The best time to write is often when there is nothing else to do. This trick certainly worked in 1816, when a single writing contest—born out of boredom caused by intense and unseasonable rain—led to the creation of several classics that helped shape the Gothic literature genre: Mary Shelley's Frankenstein, John William Polidori's The Vampyre, and Lord Byron's poem "The Darkness." The writers drew inspiration from variety of places, but one of the most important catalysts was a French anthology of German ghost stories called Fantasmagoriana. 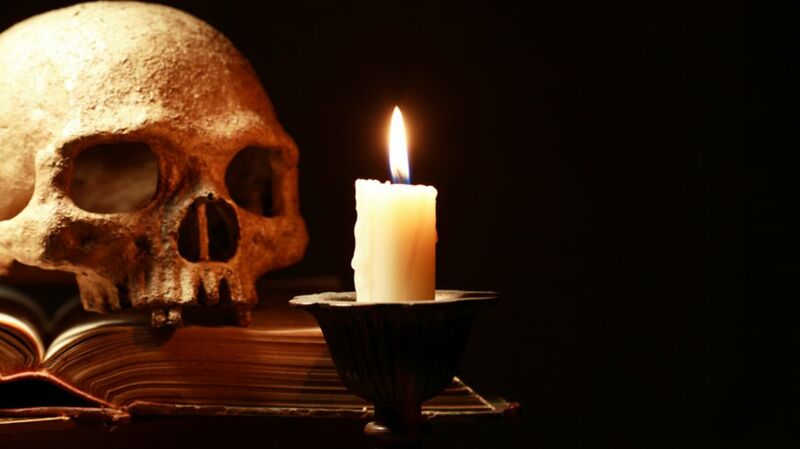 An abridged version of the tome of spooky tales, titled Tales of the Dead, has since been translated to English—and it can be read online. Fantasmagoriana was curated and translated by Jean-Baptiste Benoît Eyriès in 1812. Eyriès hand-selected eight frightening tales from German literature to present to a French audience. Lord Byron had the book on hand while staying at a villa near Lake Geneva with Polidori, his personal doctor. Mary Godwin (soon to be Mary Shelley), Percy Shelley, and Godwin's stepsister Claire Clairmont came to visit, but they all found themselves trapped inside due to the nasty weather. Lord Byron entertained his visitors by reading aloud from Fantasmagoriana, along with other scary stories like Samuel Taylor Coleridge's poem "Christabel." While Lord Byron captivated his audience with stories of ghosts and spirits, a dark storm outside created the perfect atmosphere. The spooky mood inspired the group to create their own versions of scary stories in a friendly competition. According to The Lady and Her Monsters, Lord Byron declared "We will each write our own ghost story." The writers worked at their own pace, each struggling to get started on their story and being secretive with their ideas. Mary Shelley later said those summer nights were what started her famous novel, and named two stories from Fantasmagoriana that directly inspired Frankenstein: "The Family Portraits" and "History of the Inconstant Lover." When I placed my head on my pillow, I did not sleep, nor could I be said to think. My imagination, unbidden, possessed and guided me, gifting the successive images that arose in my mind with a vividness far beyond the usual bounds of reverie. I saw -- with shut eyes, but acute mental vision, -- I saw the pale student of unhallowed arts kneeling beside the thing he had put together. Polodori settled on expanding one of Lord Byron's discarded ideas. His story became The Vampyre, which is considered the first portrayal of the vampire as we know it today. The doctor would also claim that the writing sessions led to another story, Ernestus Berchtold, which was inspired by the rumors of Byron's affair with his half sister. Lord Byron, meanwhile, wrote "The Darkness," an apocalyptic tale of a world without any light. Thanks to Archive.org you can read the English version of the anthology that inspired these classics for yourself. Maybe after reading, you'll be inspired to write your own scary stories to tell this Halloween.